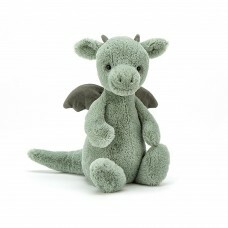 Bashful Dragon is a fierce little friend, with plenty of attitude! With supersoft fur in pale sage green, suedey horns and a long, squidgy tail, this brilliant beastie is pretty fantastic. We love those neat little contrast wings, chunky feet and fine flappy ears - what a legend!